Democratic Senator Bob Menendez of New Jersey is calling on the FBI and Department of Homeland Security to investigate whether employees at Trump National Golf Club broke the law by helping undocumented employees obtain fake work papers amid news reports that the Trump company has fired at least 18 undocumented workers from five golf courses in New York and New Jersey in the past two months. Democratic Senator Bob Menendez of New Jersey is calling on the FBI and Department of Homeland Security to investigate whether employees at Trump National Golf Club broke the law by helping undocumented employees obtain fake work papers amid news reports that the Trump company has fired at least 18 undocumented workers from five golf courses in New York and New Jersey in the past two months. On Monday, Menendez called on the federal government to allow former undocumented employees of the Trump properties to remain in the country while the investigation proceeds. 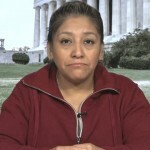 An undocumented housekeeper from Guatemala named Victorina Morales is interviewed. She helped expose what was happening on the Trump properties by speaking on the record to The New York Times. Morales spent years making Donald Trump’s bed and performing other duties at his New Jersey club, even though she was undocumented. She attended the State of the Union as a guest of Democratic Representative Bonnie Watson Coleman of New Jersey. Morales, Watson Coleman and Morales’s lawyer, Anibal Romero are interviewed.